Have you ever seen a progress bar that goes from empty to full then starts over at the beginning again? I really hate those. I had always assumed that progress bars were pretty uncontroversial. It wasn't until I worked at Intelerad for about a year that I found out that many people don't actually understand what progress bars are for, how they should work or how to write code to implement them. 1) That the computer is doing something that'll take a while. 2) That the computer hasn't frozen or otherwise become unresponsive. 3) Approximately how long the computer will be busy. It's important to remember that a progress bar is not to display the progress some arbitrary chunk of code. 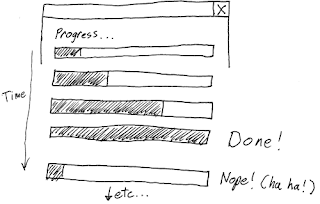 If you think of a progress bar showing the progress through some function or chunk of work, you're likely to show multiple progress bars in a row where each filling of the progress bars will represent the progress through a particular task. Don't do this. What the user actually wants to know is how long the computer will remain busy doing its thing. Alternatively, how long it will be until the computer returns a result. 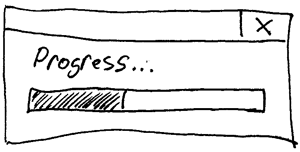 When you've filled up a progress bar and restarted it, you're messing with the user's head. A common worry when creating code that has a progress bar is that if you show progress bar for the entire time the computer is busy, and not for individual subtasks, then that code will not be reusable. It won't be reusable because you'll have to hard code the values you're setting the progressbar to in that function. As a result you won't be able to use that code with, say, another progressbar because the values that you need to set the progress bar to in that context will be different. 80% done for this progress bar might be only 40% done in a different context. It's actually very easy to create little subroutines that only worry about the progress though their portion of the task and then wrap those progress meters into meta-progress meters to show the progress through any larger task. Here's how you do it. Think of the progress through the overall task as being the sum of the progress through each individual task. Looking at the problem this way it should become apparent that each sub task can look at its own progress as going from 0 to 100% with this value being a smaller proportion of the progress of the overall task. Here we can see that the first subtask's progress, as a value that goes from 0% to 100%, is equal to the overall task progress going from 0% to 40%. All we need to do to convert the sub task progress to the progress through the overall task is to multiply it by .0.4 (or 40%). Let's say that our first sub task is composed of two subtasks. The first sub sub task goes from 0 to 30%. 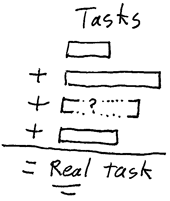 We can calculate the value of the subtasks progress by multiplying the sub-subtask progress by 0.3. We can then see the sub sub task's contribution to the overall task by multiplying it by 0.3 then 0.4 (or 0.4 * 0.3 = 0.12). So when the sub sub task gets to 100% we will have completed 12% of the overall task. Here' how you do this in code. I'm going to use java because lots of people use it, understand it and it's what I know. * @param progress number between 0 an 1 that signifies the progress through a task. *            to take.. More takes longer. Oh course with real code you'd be something useful, but you get the idea. * Allows for a progress bar made up of multiple sub progress bars. * THis method will also advance the previous sub progress bar to 100%. The idea is you'd pass the Progress object representing the overall progress and you'd call buildSubProgressBar to, well, build the sub-progress Progress objects. * Demonstrates how the progress bar can be used recursively. throw new IllegalAccessError("\"progress\" should be less "
* The length of the current sub progress bar. You can then place this JProgress into a JFrame and send the Progress object to the CompositeProgressBar constructor and you're all set. Congratulations. You are now masters of the first level of progress bar Fu. You can write a progress bar that accurately reflects the progress of the overall task, even when the overall task is made out of little, tiny pluggable pieces of code. What is more, those little tiny pluggable pieces of code can now be reused in different contexts, with different progress bars. This is truly a great day for the user. The remaining question is, how do you get to level 2 of progress bar Fu? Ah, that is a good question young grasshopper. What if, you have a task for which it is completely impossible to gauge how long the task will take? What if, you have a task for which you have a rough estimate for how long it will take but, you have no way to increment the progress bar because your code is blocked doing something else. For example, it may be doing some I/O in a different thread. Alternatively, maybe running a third-party process and there's no way for you to get any feedback about what that process is doing. Now would you do? Hmmm, interesting post. Very useful too. I'd like to see what you have to say in Part 2, because to me it looks like whatever you pass to buildSubProgressBar() is a guess. And I assume that, since we're smart coders, we can actually resort to some fancy handwaving to estimate what that chunck of code should represent in the overall scheme of things. In other words, "How can I guess how much of the overall processing time will this sub-task consume?" Or am I just not getting this? The short answer is you need to profile. Essentially you run the code with some real data and measure how long each part takes. You can use this information to figure out what numbers to pass to buildSubProgressBar(). Progress modeling makes an assumption (my system and my systems conditions are the same as yours) that may be badly flawed. Network data access speeds vary over a very wide range. Local File I/O performance varies - especially if file cache effects participate. GPU (if involved) capabilities really vary. CPU speeds vary to a lesser extent. The thing with progress bars is that you need some kind of general information about the process you are trying to describe. When talking about network access, which might suffer from congestion, you could use a floating average always assuming you know the total size you are downloading. That naturally extends to other things that might take varying amounts of time, especially if they are accessing resources you cannot control. For subprocesses implementing algorithms you could also use the Big-O of that algorithm, if you know it. Obviously well-known algorithms are great fits for this. Making a best guess is often good enough - if the user knows the step might take a long time to complete it's ok to say something imprecise. For example a sorting step using quicksort might be faster than what the Big-O for the expected runtime says it is (accounting for the constant factors in the calculation, of course!) but that's ok. It's a best guess. Computer people (programmers et al) often think/say that users are idiots. Programmers are often idiots too. Let's look at an example. Let's say we have an overall task composed of three subtasks. The first sub task is 40% of the overall task. The second sub task is 50% of the overall task. The last task is 10% of the overall task. The bit I don't get is where you came up with the figures of 40/50/10 ? How do you know those percentages? Wouldn't the best/easiest way just to say each subtask is 1/3 of 100%?